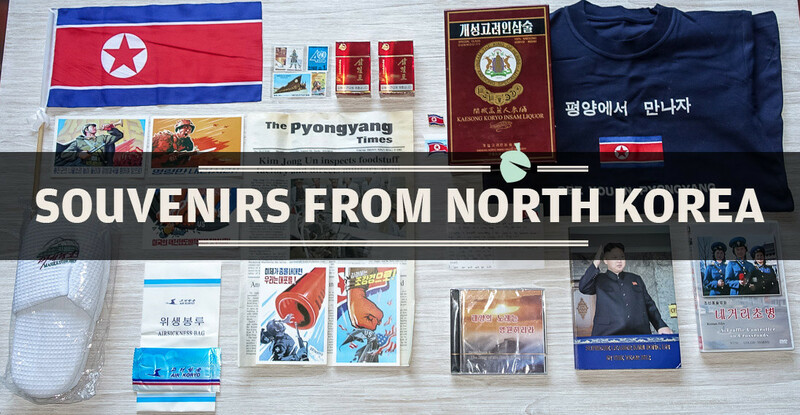 In a Nutshell: It may surprise you, but as a tourist to North Korea you’ll have ample opportunity to purchase traditional souvenirs. You’ll find souvenir shops inside major hotels or nearby major tourist attractions such as Kim Il-Sung Square and even the DMZ. They sell anything from books, posters, postcards, stamps and artwork, to CD/DVD’s, food items including liquor and even apparel. I’m generally not a fan of souvenirs (I travel light!) but in North Korea I make an exception. 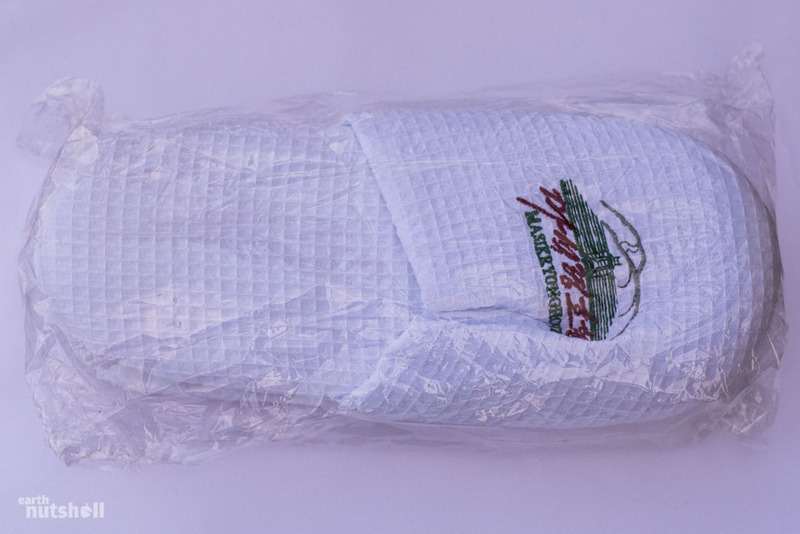 It’s the genuine product made locally and the items are unique, wacky and often confronting. Here are the souvenirs I acquired during one particular visit! North Korean postcards are not subtle. They’re often bright, militaristic, confronting and presented to be motivational. By sending one, you may make a postman’s day or perhaps add yourself to a government watch list. I have about thirty of these postcards, each has different socialist-realist artwork and unique slogans that reference parts of North Korea’s revolutionary history and their goal of a prosperous future. The anti-American and anti-Japanese sentiment remains strong, but in general these postcards reference proud aspects of contemporary North Korean culture such as scientific advancement, the Songun Policy, Juche Idea or Chollima Movement, the role of North Korean children as future intellectuals, the celebration of sporting achievements or performing arts, the opening of Masikryong Ski Resort and even tributes to bean farming policy. A mosaic of these postcards would give a clear indication of what the North Koreans hold dear (officially). This fine beverage is a ‘Special Class Commodity’ and due to its high price tag, is only available to the wealthy, generally those that are part of the emerging middle-class or elite in Pyongyang. If the box is to be believed, it’s earned both ‘Gold Medals’ and ‘Diplomas’ to international acclaim. 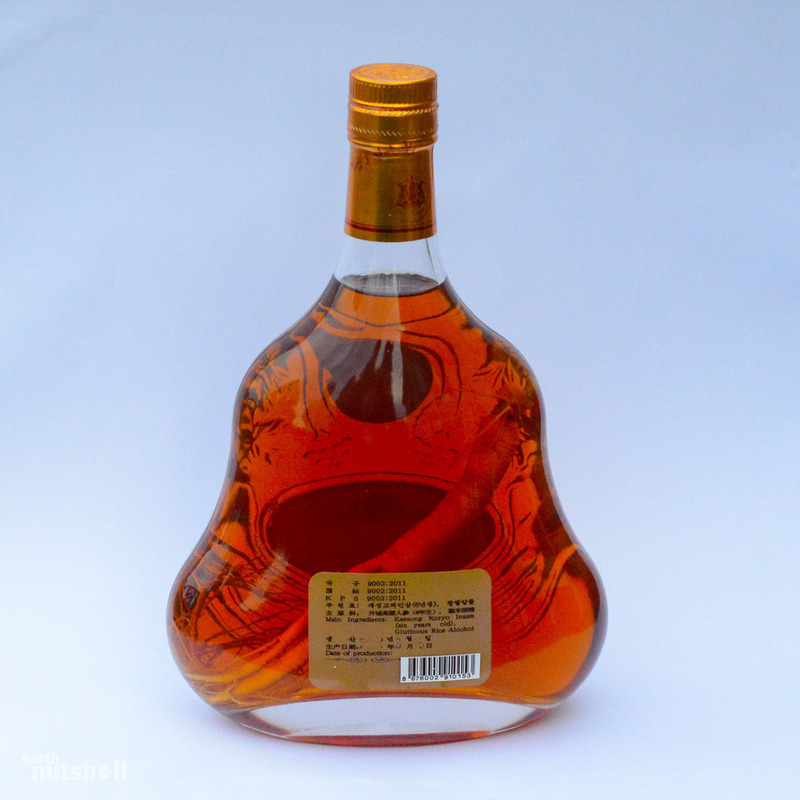 It’s a 700ml, 86 proof bottle of 20-year-old rice alcohol distilled and bottled in Kaesong, North Korea. It contains Kaesong’s speciality ‘insam’ (ginseng), an extensive root plant that’s been grown for six years, the perfect timing to highly concentrated nutrients. The ginseng is said to wield a myriad of medicinal benefits such as beating physical or mental fatigue to treating diabetes. Ginseng is found globally but the Korean ginseng has a solid reputation, North Korea even started producing a ‘wonder drug’ named Kumdang-2 which contains ginseng and traces of rare earth metals such as gold and platinum. It allegedly cures Ebola, AIDS, MERS, tuberculosis and cancer. I purchased this liquor from the Kwangbok Supermarket in Pyongyang. At the time, this store had only just opened and I was just the second foreigner ever allowed inside. A plaque on the entrance commemorated the dates that both General Kim Jong-Il and Marshal Kim Jong-Un had given ‘field-guidance’ to the store. Photography was banned (and it remains that way) and I was permitted only to visit the first floor (this restriction has since been lifted). It’s illegal for tourists to handle local currency, so at the time I had to line up to receive a receipt, then head over to the currency exchange booth offering unofficial, black market North Korean Won rates. It was here you make payment, receive a best-attempt at change in three different foreign currencies, and then take your receipt back to collect your goods. Fast-forward two years and Kwangbok Supermarket now serves as the only place in Pyongyang that tourists are permitted to exchange and use local currency freely despite it remaining illegal. North Korean contradictions are sometimes puzzling. As I tried to leave North Korea this visit, a General from the Korean People’s Army found the ginseng liquor while searching my luggage in Sinuiju. Smiles aren’t derived effortlessly in North Korea, but after he saw this golden water I received a sparkling ear-to-ear of absolute approval. This smile then evaporated when I refused to let it go as a bribe. I enjoyed a 2.5-hour shakedown that day. I later gave the liquor to my dad and we still haven’t drunk it, I think he likes having the only one in Tasmania. Top Right: UNDP (United Nations Development Programme) technical cooperation for 40 years, 1990. Bottom Left: Mansudae Grand Monument, the anti-Japanese revolutionary struggle for 10 years, 1974. Bottom Right: Workers Party of Korea Sixth Congress decision, let’s unite for piercing penetration! The Federal Democratic Republic IO administrative policy. Frequency, equal peace, national unity (reunification). For an isolated nation with a well-documented stranglehold over freedom of communication, North Korea produce a lot of stamps. They are used in the domestic post but are primarily made for foreign consumption, particularly in China which is the largest stamp collecting market in the world. Collections are extensive and whilst military achievement, political ideology and sporting milestones play a strong role in the stamp’s designs, many of them are cultural throwbacks to ancient Korean history or even generic themed collections of dog types, natural wonders or plants. 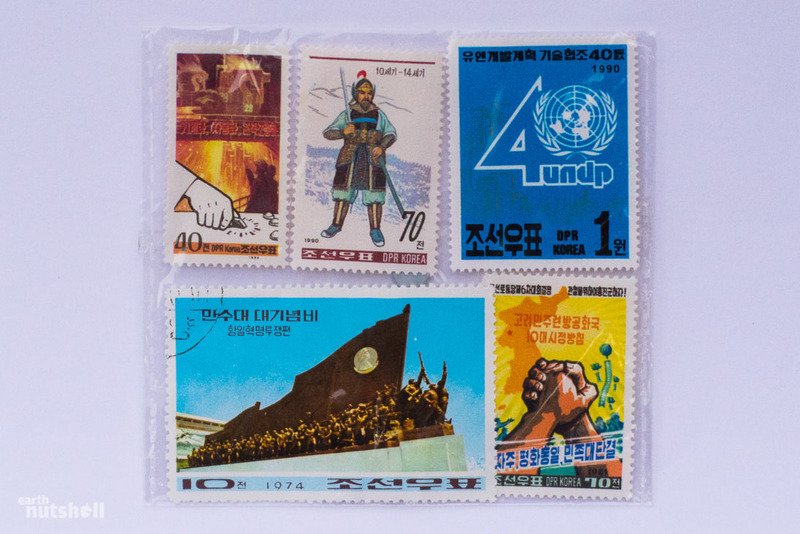 You can find extensive (and well-presented) collections for sale in the Koryo Stamp Museum in Pyongyang or the Koryo Stamp Shop in Kaesong and they are not cheap, starting at about 25 euro. Pictured are some loose sample stamps. This cheaply made Democratic People’s Republic of North Korea flag got me into a bit of strife during my visit. It was September 9, National Day, an important calendar event celebrating the founding of the DPRK. I had purchased this flag from the Yanggakdo Hotel in Pyongyang with the intention of joining the festivities with light-hearted pseudo-nationalism, which went down fantastic and derived many smiles that day. However, as the day came to an end and after tucking into my dinner, I was interrupted and taken aside by one of my guides to be briefed on the situation. Upon arrival back to the hotel, I had left all but my necessities on the bus. It was common for us to leave waters, sweets or non-valuables at our seats (we used the same bus each day), but tonight I had also left the North Korean flag sitting in the back pocket of the seat in front. My guide asked me if I had done this, to which I responded that I had. I was then advised that the bus driver had discovered the flag and had perceived this action as a clear attempt at disposing of said flag, an anti-State hostile act on a day of such national importance. He had reported this offence to the guides. Quite alarmed at this point and with vision as to where this was heading, I gave my utmost apology to my guide, which it was filtered back to the driver. Some tense minutes followed before my apology was accepted, and I was told to collect my flag and put it into safe keeping. To leave North Korea with this flag was always my intention, but in that moment it did not matter. The situation could have escalated and it was as simple and as innocent as that. As a traveller, it is important to be well aware of, and show respect and sensitivity to, the cultural norms of any nation, but nowhere is this more important than in North Korea. The stakes are higher and this transgression was a stern reminder. From that point on, my flag was carefully folded and kept in my luggage like a pet rock that I checked up on regularly. Here it is for your viewing today. An interesting memento. 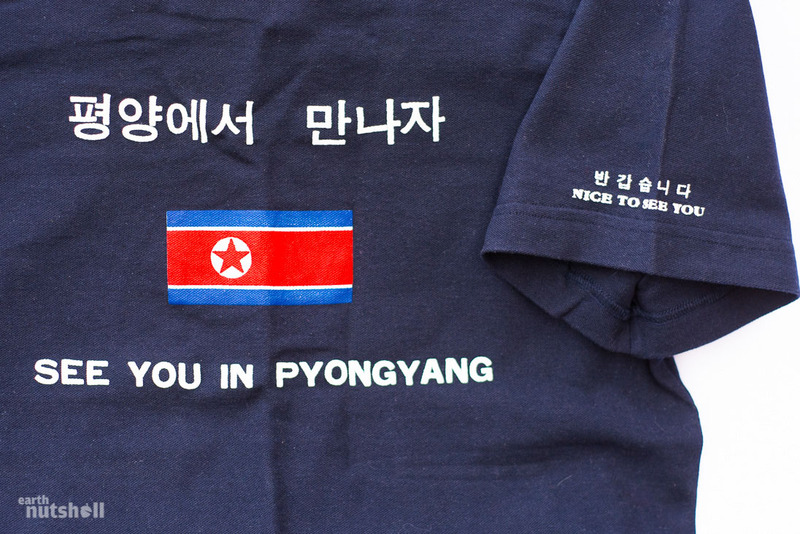 At the time, this t-shirt was the only government-approved apparel for sale to tourists in the entire country of North Korea. I only saw it for sale once in Pyongyang. The design is about as sterile, unimaginative and tacky as souvenir t-shirts get, the kind that first-time tourists to San Francisco hold no shame wearing. In saying that, most of us on this tour (including me!) purchased one despite a meagre choice of just three colours. We did yearn for some variety, and even with money to spend, it was a quick crash-course in socialism: Despite our demanding fists full of cash, supply was bottlenecked by the state apparatus. Market freedom is limited, locals simply cannot produce their own designs and sell them legally. On the back below the neck is a small land mass map of North Korea, with the text ‘Pyongyang DPRKorea’. This t-shirt got me a lot of attention in China on the day I left North Korea (because of course, I was wearing it!). Firstly, I apologize for my handwriting. It is shameful. 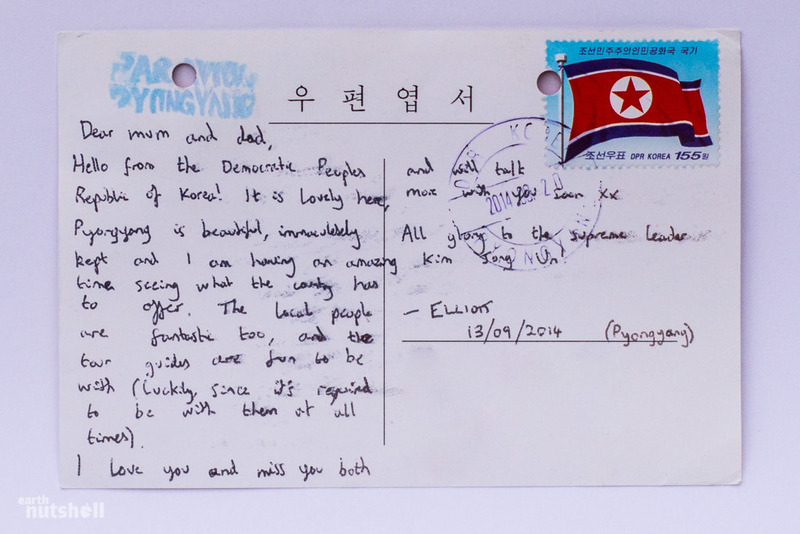 Anyhow, this postcard I sent from Pyongyang to my parents on 13/09/2014 took many months but eventually did turn up. All postcards sent from North Korea are translated and screened by officials, so my words were chosen wisely. Anything untoward or critical ensures it’ll never see beyond the border and may land you in hot water. I did my best to sugar coat the experience for this reason, but frankly, it’s mostly genuine. My tongue-in-cheek ode to the Supreme Commander Kim Jong-Un at the end was walking a fine line, but I simply couldn’t help myself. I purchased this DVD from the Grand People’s Study House in Pyongyang. 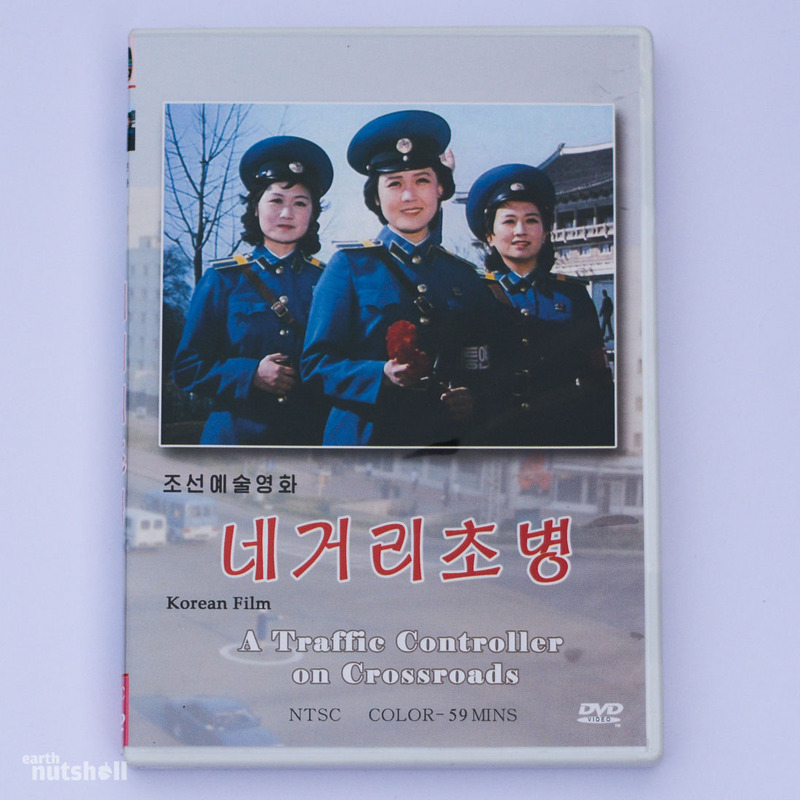 It’s directed, produced and distributed in North Korea and stars the iconic Pyongyang traffic ladies that I am convinced are subject to a nationalistic fetish in North Korea. You will notice the distributor is ‘Mokran Video’, the ‘mokran’ (mongolia) is North Korea’s national flower and you’ll find this logo on every DVD legally sold in Pyongyang, even on the disk of familiar western titles such as Tarzan, the Lion King and Aladdin that can be found readily available in street stalls; they have been pirated and are sold at a state level. Pyongyang’s traffic ladies are synonymous with Pyongyang city life and it’s a well-regarded position rumoured to be fulfilled by only those women handpicked by Marshal Kim Jong-Un himself. Whether rain, hail or shine these beautiful women are dressed immaculately and operate near robotically with movements of militaristic intention. Nobody dare crosses the intimidating law enforcement of the traffic lady on the streets of Pyongyang and due to a lack of ‘orange light’, you’ll often witness cars come to a screeching halt at the change of their signal. The women will also salute passing vehicles driven by Worker’s Party of Korea officials who typically have number plates beginning with 7-27. This number represents July 27, Victory Day on the North Korean calendar when the armistice was signed marking the end of fighting in the Korean War. 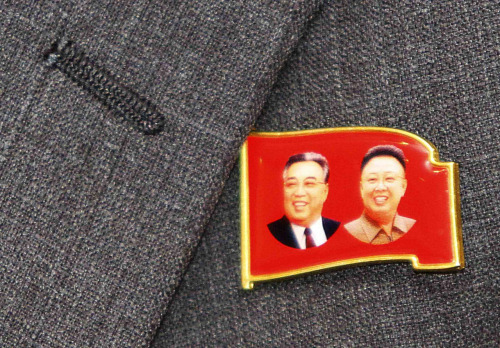 All North Korean citizens must wear, by law, a lapel pin of the late leaders above their heart. Ordinary citizens usually wear that of either President Kim Il-Sung or General Kim Jong-Il themselves, while those of higher social status are permitted to wear a more expensive, double portrait version. As a foreigner, you aren’t allowed to purchase the authentic pins, they must be presented to you (which has occurred for some foreigners working in the country). 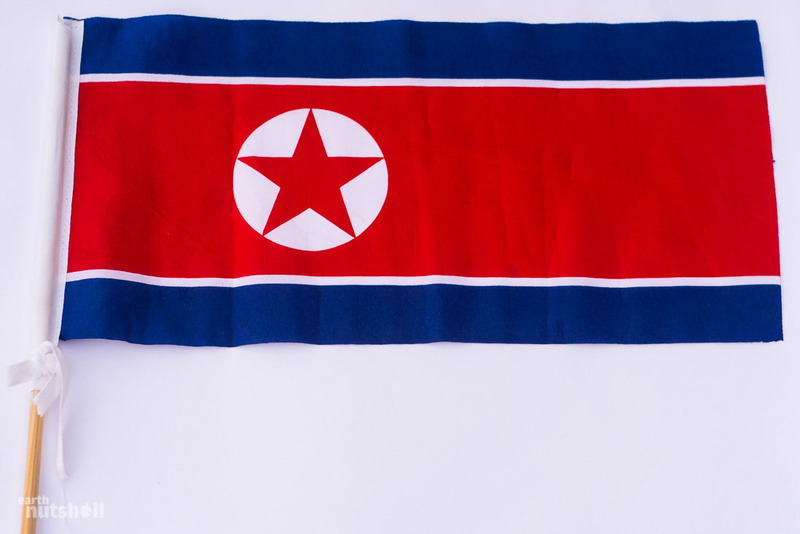 Tourists are instead urged to buy the (less interesting) souvenir North Korean flag version pictured here. So I did. The stamp was actually given to me as part of my change when a venue ran out of foreign currency, as you aren’t aren’t allowed to handle or use the local North Korean Won. “Cigarettes are harmful for your health.” Surprising, right? 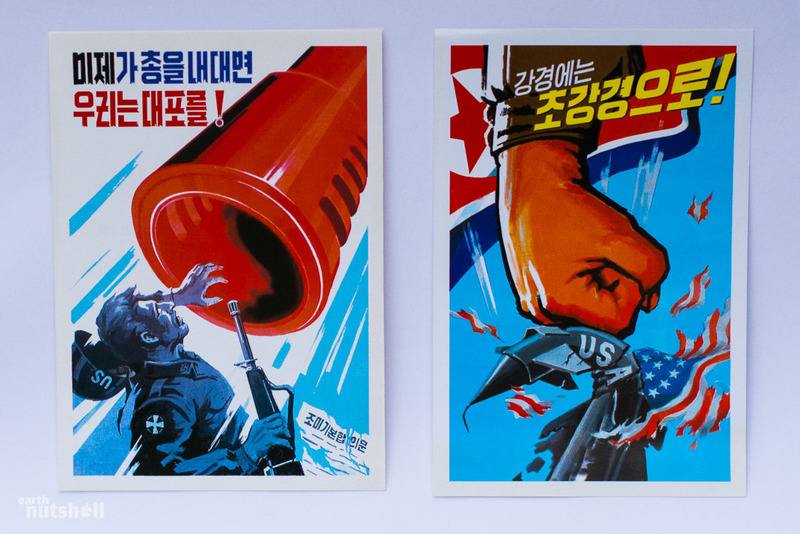 The juxtaposition between health warnings adopted by most of the modern world and the otherwise concerning lifestyle conditions forced upon citizens of North Korea may leave you scratching your head. Me too. Has North Korea truly adopted such a reasonable stance on a known health hazard? Probably. Alternatively, it’s been hypothesised as a way to reduce the value of cigarettes as a currency between North Korean people, primarily bribery. Plausible. 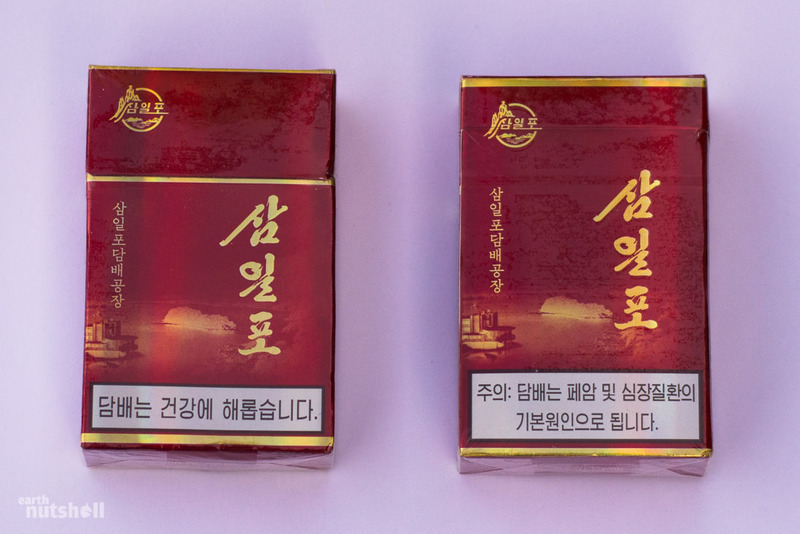 Commodity scarcity is rife, making cigarettes a highly valuable currency on the North Korean markets. These cigarettes in particular, ‘Lake Samilpo’, are named after a south-eastern lake of the same name I visited in North Korea. A non-smoker myself, and one that’s likely spent too long in Asia, I purchased them as an icebreaker and currency. Unbeknownst to me, they’re a highly regarded brand associated with male status in North Korea, so I ended up handing out packets like the Santa Claus of cigarettes. This couple I kept as product mementoes, though! I purchased this book at the Foreign Language Bookstore in Pyongyang. 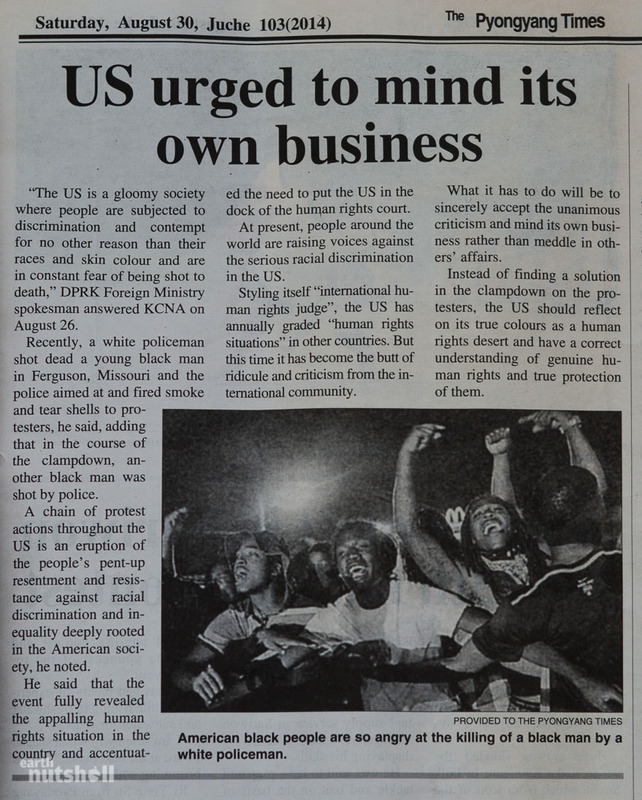 A small trusted group of foreigners are employed to translate Korean publications into other languages to distribute the re-education beyond North Korean borders and into international acclaim. 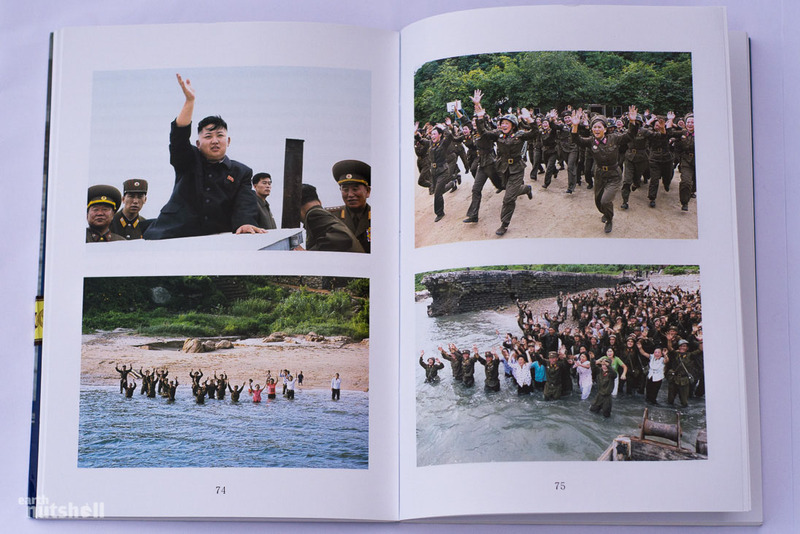 This particular book was widely distributed, I saw it at most souvenir desks during my visit to North Korea. I’d say this is because the transition between Kim Jong-Il and Kim Jong-Un’s new leadership is still a sensitive political topic and they’re trying to get some circulation. Confidence from the people in Kim Jong-Un as the new commander is paramount to North Korea continuing forward unchanged. 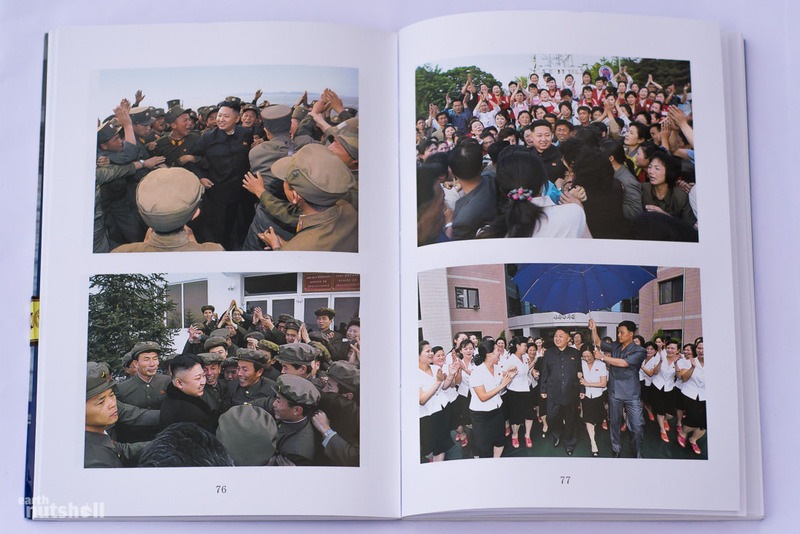 The entire book is a celebration into Kim Jong-Un, in particular, his ‘accomplishments’ and the unconditional, endearing love he has (already) ‘earned’ from his people. Relatively unknown prior to his leadership, Kim Jong-Un is now undergoing a phase where a narrative is being constructed and attributed to his life for propaganda purposes, much the same as his father and grandfather. I mean, he is the Supreme Commander of the Korean People’s Army, the fourth largest army in the world and has had no formal military experience. He needs the storytelling behind him. Air Koryo is North Korea’s only airline, it’s state-owned, the flag carrier and the first point of contact for you as a foreigner into the hermit kingdom. The Pyongyang Times is complimentary upon boarding, and the stewardesses don their leaders pins above their hearts. It’s the only one-star rated airline on earth, and until 2010 was banned from entering the European Union due to safety and maintenance concerns. Was it that bad to fly on? I didn’t think so, but the food quality is in a league of its own, even by airline standards. Their idea of a vegetarian burger was two pieces of bread with lettuce. I’m not exaggerating. I mean, I guess technically correct is the best kind of correct after all. Either way, I wanted to take a memento from the flight with Air Koryo as Air China printed my boarding pass in Beijing and it didn’t tick the souvenir checkbox…so the next best thing? 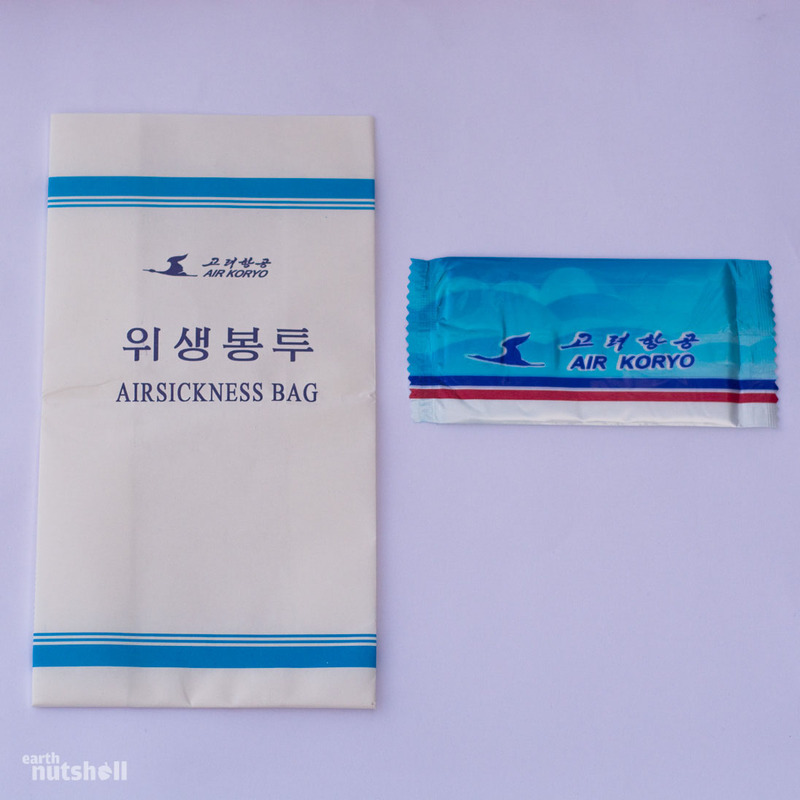 An Air Koryo branded air sickness bag and hand-towel. I hold no shame! Ordered by Kim Jong-Un himself, Masik Pass Ski Resort was built by the Korean People’s Army in just ten months to boost tourism numbers. After my visit, I can confidently claim that Masik Pass is far and away the most luxurious building available to the ‘public’ in North Korea. Easily. So, I took their slippers. I think that was allowed, but I’m unsure. If not, I apologise, and they’re still in their shrink wrapping. Sadly, there was no matching gown. Masik Pass was simply stunning inside, it’s nothing like anywhere else we stayed. It’s on par with international luxury standards and reminded me of The Venetian in Las Vegas, especially the bathrooms. It sits in the middle of nowhere with a bright allure. Not bad for a country with a power shortage, especially considering we were the only guests, and the staff outnumbered us. Man, that was a weird visit. Another fun fact: Masik Pass came to international notoriety in 2013 after having it’s outsourced ski lift order blocked by the United Nations, classifying it a ‘prestigious propaganda project’. North Korea officially responded by labelling the decision a serious abuse of human rights. 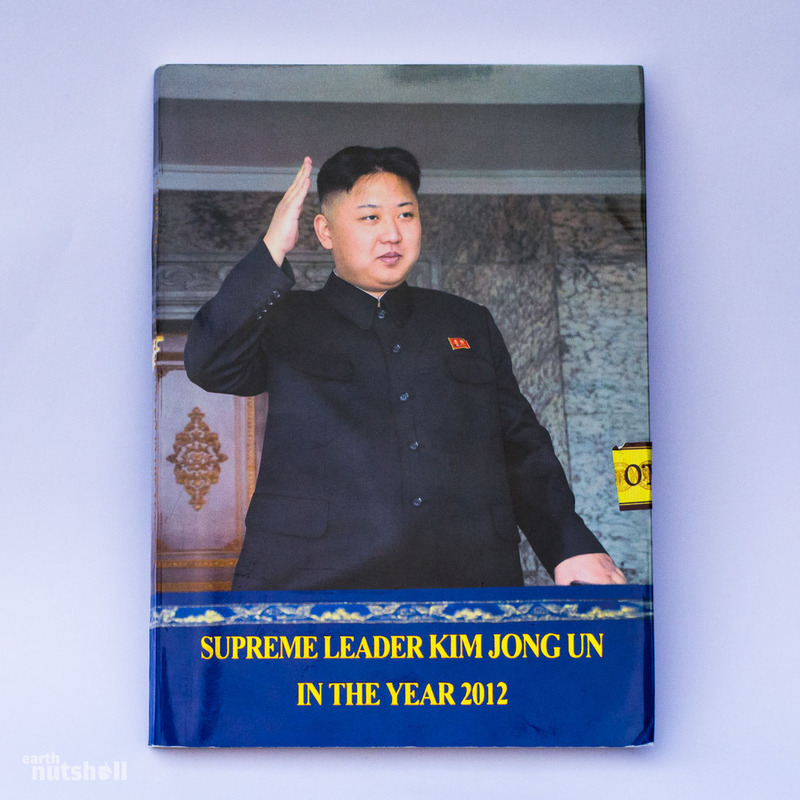 With modern classics such as “Long Live Generalissimo Kim Il Sung”, “Our Leader Beloved of People” and “The General Lives Forever as the Sun”, I just had to have it. 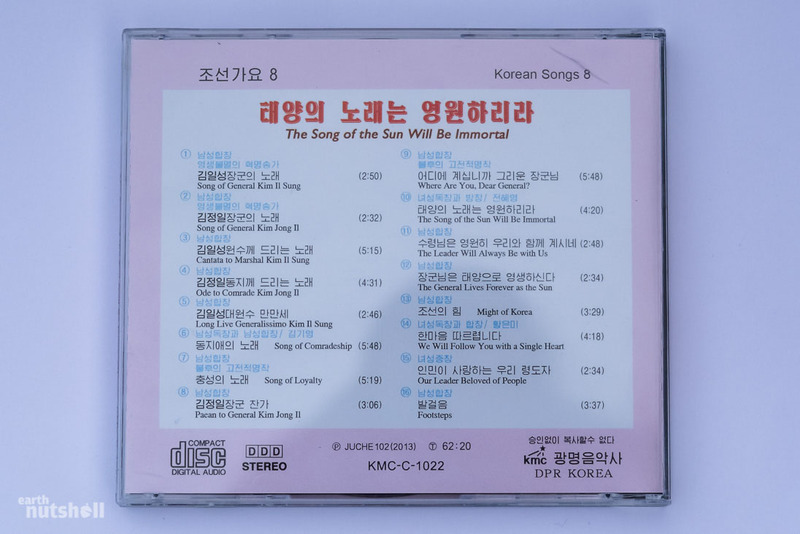 Apparently the eighth CD in the collection, a quick ponder of the track list may leave you wondering how many further amalgamations of Kim Il-Sung and authoritarian synonyms are left mathematically possible. In all seriousness, I wanted to leave North Korea with something like this. North Korean music is unique, every song is politically influenced — pop music as we know it simply does not exist. Musical freedom is undefined, it’s usually militaristic, upbeat and supported orchestrally with female vocals. References to the leaders and self-reliance ideology are certain. I watched many performances on Korean State Television in Pyongyang, and it focussed more on the religious celebration (of the leaders) than the music. Amazing stuff, and a great souvenir. 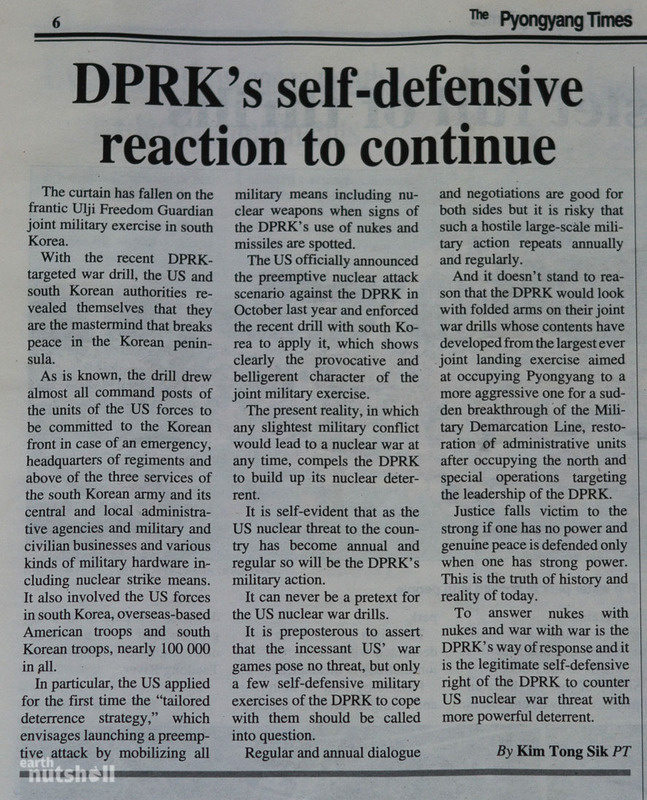 The Pyongyang Times is the foreign language edition of the local Korean newspaper distributed across the country. This newspaper is North Korean citizens’ only exposure to the outside world, it’s state controlled and offers a restricted view of reality. It’s a fascinating read. I was told that by law, Kim Jong-Un is featured on the front page of each edition and that it’s illegal to fold in the middle, as it could crease the Great Leader’s head. The paper cannot be used in a disrespectful manner (firestarter, cleaning a mess, etc.) as it retains near holy status, outlining the progression of the Korean people and the Juche ideology. 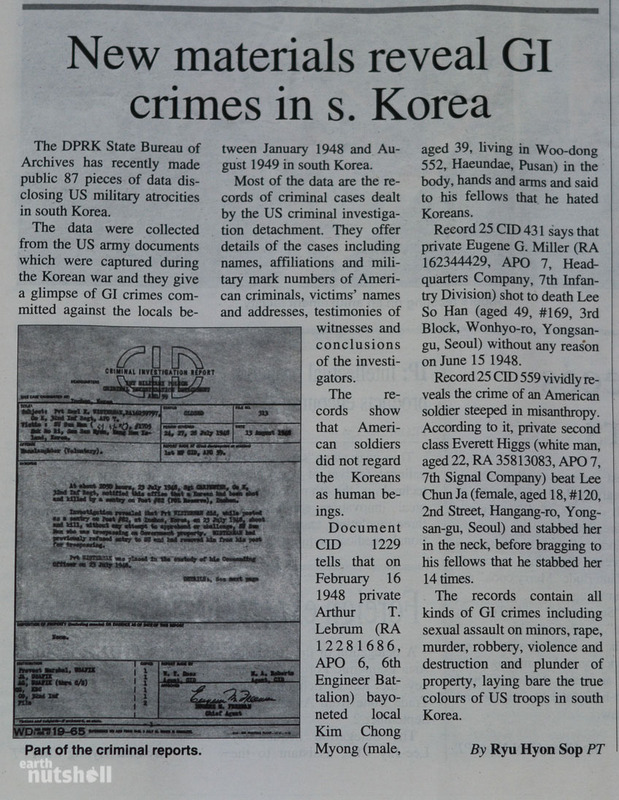 I read three editions and found that each one followed the same structure, beginning with political accomplishments and celebrations, followed by technological and social breakthroughs before offering a double spread in targeted, aggressive propaganda claims towards South Korea, United States and Japan. Facts were optional. Sport and smaller success stories were on the back page. 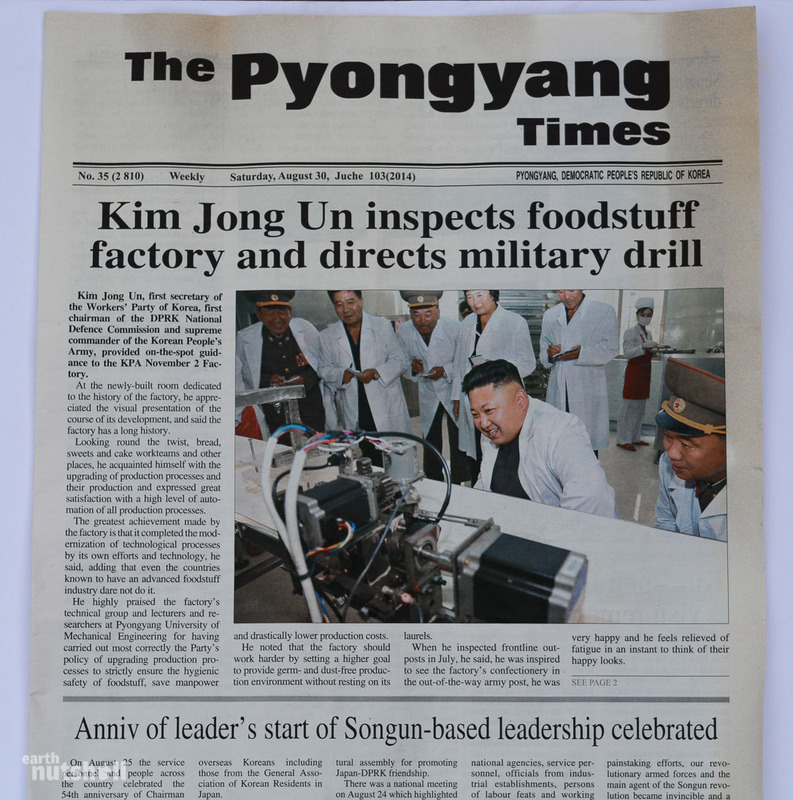 The Pyongyang Times has in the past been scrutinised due to its creative licence, including claims of South Korea’s ‘poor human rights record’, of maintaining a 50% unemployment rate and their spread of incurable disease. This newspaper was one of my favourite souvenirs. I’ve included three articles below from inside, they’re an entertaining read. P.S – Do you have any souvenirs with an interesting story from your travels? If so, I’d love to hear about it in the comments below! 1- With so much anti-American propaganda there, is it even safe for an American to visit North Korea (assuming they were even able to)? 2- Are you ever afraid that some of the things you’ve written in your blog will make it back to North Korea, thereby preventing you from visiting again? 3- Not necessarily related to your North Korean trips, but as someone who travels alone also are you ever weary of a language barrier? Based on your travels, I would guess not, but it has kept me from visiting more remote areas of the world where English would likely not be understood at all. Fantastic article and story, Elliott! I really enjoyed reading these and the pictures – as an American I doubt I would ever gather the bravery to travel there myself, so for now I’ll just travel vicariously through your photos/stories. You should write a book about this! As it looks like you’ve gained more access and insight than many journalists/reporters have ever been able to do so! Thank you mate. As far as tourism goes, I visited the DPRK at a lucky time, just prior to the entire country going into lockdown for months due to the Ebola scare. Nobody in, nobody out. Fortunately, the itinerary I was on was one of the longest ever approved for foreigners, so there was a number of places we went that very rarely saw visitors, Pujon County and Haeju were two off the top of my head, but the extra time overall allowed us to go into a bit more detail everywhere; some downtime at two beaches for example, which may not seem much…but it was pretty surreal to swim at a North Korean beach looking out into the militarised sea. Also, journalists and reporters aren’t allowed to visit North Korea unless it’s a special circumstance — their visa will be denied and they are instead put on a waiting list for a media visitation visa. 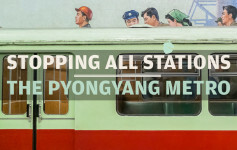 Last I heard, this waiting list was six-years long and all you get at the end is a cookie-cutter Pyongyang visitation to the well-documented main sights and the DMZ over about three, maybe four days; heavy restrictions prevent even filming out the window. Hi Elliott! Great blog and thanks for posting this. I am very curious about North Korea and I’m sure I will visit it someday. I just added your blog to my favourites. I am also very curious about the North Korean music you got. I’d be very thankful if you could share it with us, if you uploaded the tracks to MEGA or Mediafire and put the link here. 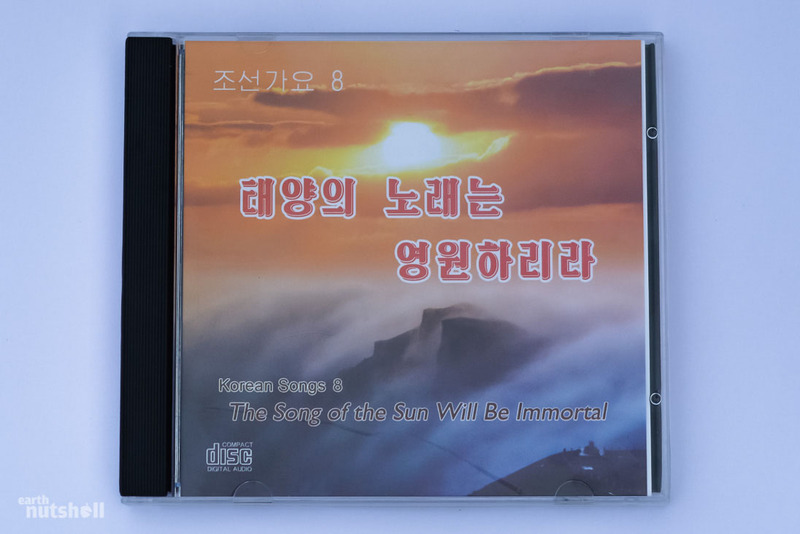 I’d love it, also because the quality of the songs from CDs is much better than that from songs from North Korean official websites (such as Naenara). Thank you very much. Hey Sergio, thanks for your comment. I’ll see what I can do, I wonder how far North Korean copyright law extends! Couldn’t be worse than the RIAA, surely. Just read your great blog! 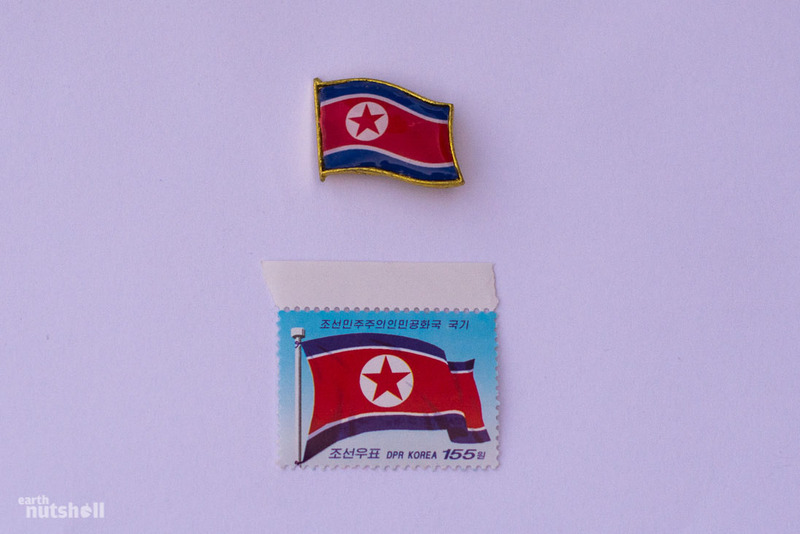 Im traveling to North Korea this summer, i have picked up a few lapel pins when i was in China. Was thinking of wearing it while in North Korea, but do you think they’ll be offended if i wore it ? Honestly, as tempting as it is, I think it may be a bad idea. I doubt you’d get into any trouble, but it’d almost certainly be perceived as rude and insensitive by many, in particular those locals that aren’t your tour guides. Of course, you are well-meaning and want to wear it as a sign of respect, but I feel it would instead be interpreted as the tourist treating their system as a novelty, which to North Koreans it’s anything but. To back this up, as a tourist it’s not possible to buy these lapel pins in North Korea — they instead urge you to purchase the one depicting the DPRK flag I’ve photographed above. This suggests to me they’d rather non-Koreans that aren’t dedicated to their cause from representing the (almost demi-god) leaders. It makes sense. It’s worth remembering also that the double portrait version you’ve pictured is quite exclusive in North Korea, in many ways a status symbol reserved only for those in a position of authority, who can afford it. Hope this helps you and enjoy your visit to North Korea! I have never been out of North America. My only international souvenir was a keychain from royal Caribbean cruise lines. There’s nothing wrong with that, in fact I find most souvenirs to be tacky, Chinese-made products that unless they’ve a story attached, are not worth their weight to carry. North Korea to me was an exception, the items were just too quirky to pass up. North America is incredibly diverse, oh how I’d love to road trip into Canada, be able to hop down to Cuba, or simply drive the United States — there’s endless adventure at your fingertips. Although travelling far and wide can certainly add to the excitement and culture shock, it’s not necessary to enjoy what travel has to offer. The grass is always greener on the other side, this is especially true in travel! May I ask roughly how much the liqour cost you in USD? I’m so curious about it..
Hi Anthony, it was about $38 USD. This appeared to be local price converted into USD at the black market rate from Korean Won, the price was on the shelf. The supermarket was targeted towards Pyongyang locals as opposed to a ‘souvenir’ desk type outfit that targets foreigners, so assuming the conversion was correct then this price was in line with local pricing, making it a very expensive luxury good in Pyongyang. 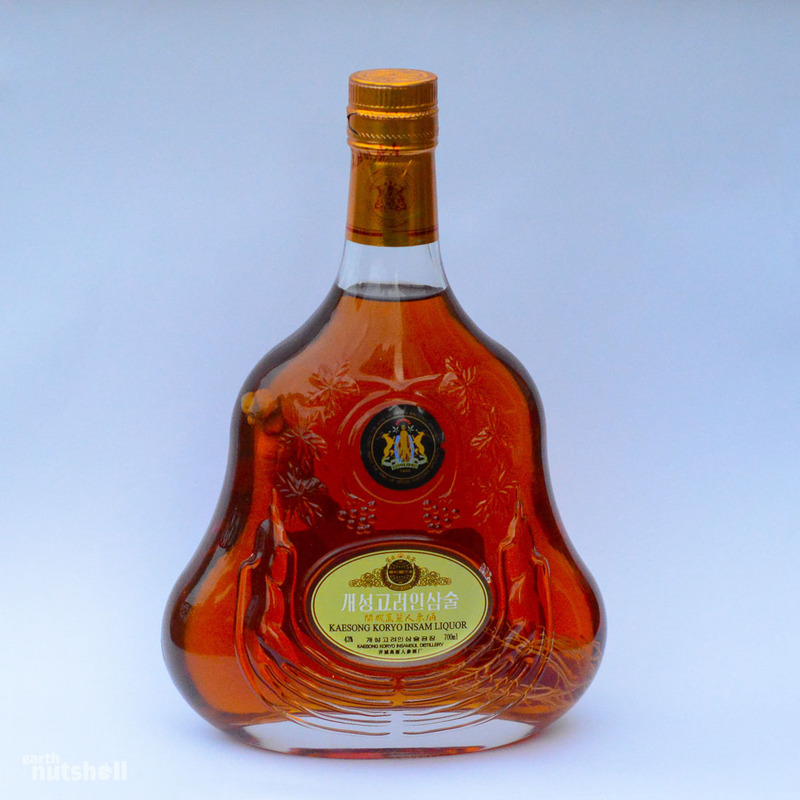 How was the Kaesong Koryo Insam Liquor? It’s hitting the news this week as being “hangover free”. Hi Amy, my father and I haven’t yet opened it! Based on what Dear Leader claims this beverage to do however, first a medical miracle drug and now the perfect hangover cure, we may well just have to hold onto it for when it solves world peace! The curiosity is overwhelming. Great post going there in October so getting pretty excited. Is it hard to get a lot of stuff with the Supreme Leader on it? Hi Dave. Your trip will be like no other that you’ve experienced, North Korea is one of most fascinating countries on earth — so you should be excited! I left with more questions than I went in with. I really recommend doing some reading before you visit, whether written texts or simply news articles, delve yourself into the propaganda and become up to date in current events affecting the region. You’ll get out of the trip what you put into it. As for your question, the answer is yes it’s difficult. If you are referring to Kim Jong-Un. There was very little in the way of texts, postcards or similar referring to Kim Jong-Un and at a guess, I’d say this is for the same reason there are no statues or murals of himself — he is still alive. 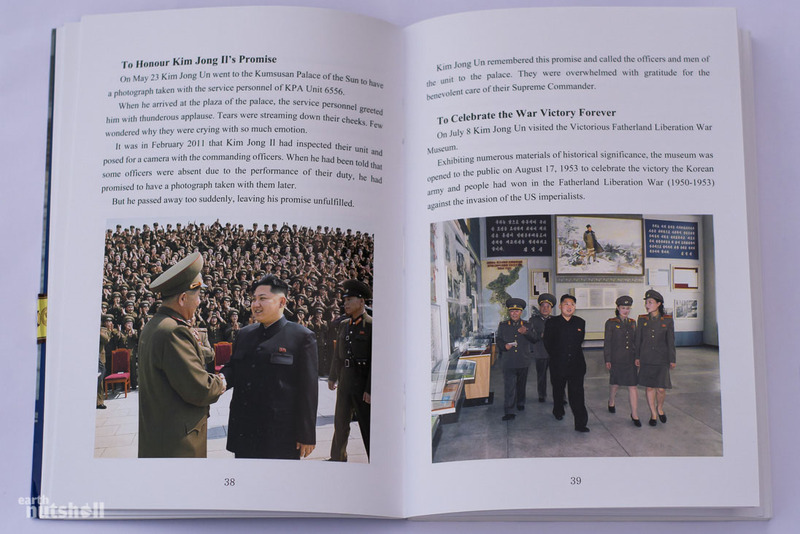 There are mountains of items available representing Kim Il-Sung and Kim Jong-Il and their ‘teachings’. If you are staying for any period of time in Pyongyang, you’ll be taken to the Foreign Languages Bookstore that’s down near Kim Il-Sung Square, it’s the only one in the country and you’ll find everything you want there. Some of the items from there you’ll see elsewhere in your trip, many of them you won’t, but this bookstore has the biggest range so I recommend getting what you want during that visit. Thanks a ton for posting all the pictures and these souvenirs, Elliott. Thoroughly enjoyed viewing them and vicariously enjoyed being in DPRK. Thanks for your comment Srinath! These are souvenirs I’ve certainly enjoyed sharing. 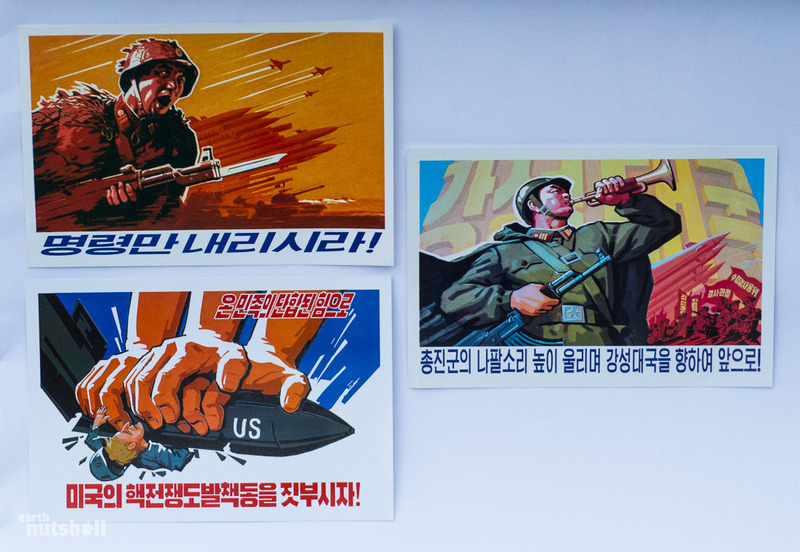 Fantastic keepsakes, and a fascinating brief into North Korea.